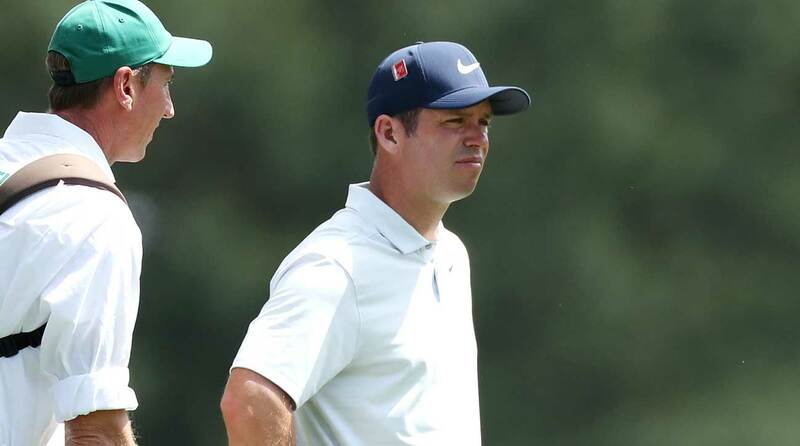 AUGUSTA, Ga. – Paul Casey peered out the window of the men’s locker room Friday morning. The other side of the window pane was covered in droplets. It had been raining most of the morning at Augusta National and it was going to be a sloppy day. Andrew Landry offered his thoughts on the soggy conditions. “It’ll smell like s—, too,” Casey added. The 41-year-old Englishman wasn’t exactly looking forward to getting outside for his second round, which was out there waiting for him, 90 minutes away. It was wet, getting wetter, and the trampled mud made it all smellier. And to be fair to Casey, none of this really mattered anymore. About 15 hours earlier, Casey stumbled into the clubhouse with a first-round 81. His tee shot on 18 clipped a tree on the way to the ground. His second shot hit the same tree and moved him all of 28 yards toward the green. His third kicked over that green. It ended up a double bogey for nine-over par and second-to-last in the tournament. Brooks Koepka played alongside Casey and beat him by 15 shots. So Casey was understandably not in a rush. He has spent the last 20 minutes thumbing through his phone, occasionally picking up his head for the next topic on First Take, which streamed on the television affixed to the wall. It was quiet in the players locker room. A relaxing setting for sure. Casey was doing exactly that. Koepka and their third groupmate, Jordan Spieth, were out on the putting green. One of them was trying to make the cut. The other was trying to extend his lead. Casey stretched his back on a foam roller and discussed the not-for-sale Nike Snake Pack shoes he was to wear with fellow Nikeman Keith Mitchell. Paul Casey's Masters was over quickly when he carded an 81 Thursday. Eighty-seven minutes before his tee time, Casey finally made a move toward the driving range, TrackMan in hand. He’d need the greatest round of this tournament to entertain the cutline. His fate was sealed with 11 unexciting pars. Seven two-putt pars and four up-and-down saves. He grabbed a Masters-branded bag of sliced apples from a cooler on the 11th tee. They weren’t tasty. “That’s disgusting,” Casey said, with part of one apple still in his mouth. He’d finish swallowing but quickly discarded the rest. The Masters-branded bag of peanuts will have to do. Whatever lingering distaste was drowned in laughter when his caddie John McLaren dropped one of the nuts into the clubs section of Casey’s golf bag. “You’ll find that Tour Championship week,” Casey said with a grin. This is what we call going through the motions at the Masters. The major-derailing round on Thursday was Casey’s worst round on the PGA Tour in over six years. It was as rare as it was puzzling. Just 19 days ago, Casey polished off a title defense at the Valspar Championship. It was his seventh top 20 this season. He’d add another one a week later. The man was playing some of the best golf of his life, and Vegas noticed: he was a mid-level 30-to-1 favorite to win a green jacket and his first major. But he would play his first 30 holes of the championship without a birdie. Only on the 13th hole of his second day did he finally make a circle on the scorecard. He exaggeratedly bumped fists with McLaren. Finally. Casey bogeyed the next hole, then birdied 17 and proceeded to bogey 18. A 73 on Friday for a 154 total. His score of 10 over eked out a win over the AARP green jacket squad of Singh, Woosnam, Olazabal and Cabrera. Koepka maintained a share of the lead. Spieth jumped back into relevancy. Casey’s world rank will drop, he’ll earn zero FedEx Cup points, but he will take home a tiny check for the effort. Meeting his wife, caddie and a few others outside the clubhouse, Casey was immediately humored. At this hushed locale, they could be heard yucking it up 50 yards away. To a reporter looking to chat in the locker room, he managed just a few words: “Not interested, mate.” His 13th Masters was over and he was out the door.